Home cinema politics Hari Krishna quits Rajya Sabha? Hari Krishna quits Rajya Sabha? TDP Rajya Sabha member and late N T Rama Rao's son N Hari krishna submitted his resignation to the membership of the Upper House in speaker format to chairman Hamid Ansari on Thursday. You may wonder about this resignation as he has already resigned to Rajya Sabha. 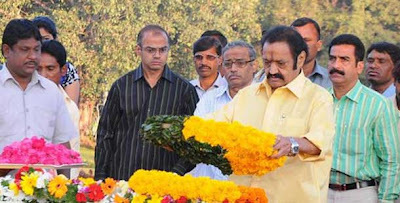 Hari krishna had in the past signed his resignation paper at his father NTR’s memorial and sent it to Rajya Sabha’s presiding officer to protest against the Centre's decision. However, it was not in speaker format. The present resignation is in support of Samaikyandhra. Hari Krishna said: "My father stood firmly for the cause of united Andhra Pradesh. Now it is shattered. My conscience would not allow me to continue as Rajya Sabha MP." The decision to bifurcate the state was taken to reap political benefit in favour of Congress in the coming Lok Sabha elections. By this decision, they killed the Telugu spirit, he added. What is his next plan? Sources close to him confirmed that Hari Krishna will begin 'Chaitanya Yatra' for Samaikyandhra. It is already reported that Chandrababu too is gearing up to begin his bus yatra. Political observers feel that if Hari Krishna begins bus yatra in support of united AP, it would be major political setback to Naidu who has been maintaining a neutral stand on the issue. It is a known fact that Hari Krishna always speaks about late NTR and his dialogues would be punch for Chandrababu. He made a veiled reference to Naidu in his speech at the Parliament. Many in the TDP feel that Hari Krishna may resign from his party soon as he's not on good terms with Naidu or Bala Krishna. If Jr NTR joins Hari Krishna's bus yatra, it will be a big boost. Many are also expecting him to float a new party.